Fiat and Ice Cube bring the Gentleman Journalist back to the '90s. While Ice Cube’s “Steady Mobbin’” may not elicit a deep Proustian reverie in everybody, it holds a special place in the hearts of those of us who grew up in L.A. way back in the late ‘80s and early ‘90s when Cube made some seriously progressive and controversial albums. Last week, the song popped up on KDAY while I was driving on the 101, and it got me thinking about back then. My surroundings, even from a distance looked mightily similar to ‘90s L.A. Traveling on the 101, depending on the time of day, is either like fighting through the hellmouth of Sunnydale or taking a pleasant jaunt through miles of concrete. Traffic was sparse that day, so I could enjoy the view. Look over there! It’s the Bowl tucked into the mountainside on the right. I looked further at the old buildings peeking up over the freeways guardrails—Hello Patron sign!—as I dropped the Fiat 500 Abarth Cabrio I was driving into third gear and exited at Ivar—the best and least congested off ramp into town. These landmarks may look the same as they did two decades ago, but things have changed. Hollywood, unlike in the early-90s, now has deeper sheen and polish, despite its still somewhat grungy nature. It’s like a simulacrum of what it used to be, a Baudrillard-ian mishmash of nice and not so nice. The Fiat isn’t too bad either. Oddly enough, it reminds me of the car I had when Steady Mobbin’ first dropped: a 1989 Pontiac LeMans, an anemic rebadged Daewood that Pontiac brought into the states to shore up sales for their compact cars. Fun fact: they also rebadged the car as UzDaewooAuto Nexia in Uzbekistan. The Fiat 500 had the upgraded BeatsAudio sound system, (and it just so happens that BeatsAudio made Cube’s bandmate in NWA about a billion dollars—small world). The Fiat 500 is way better—even in the basic, non-Turbo trim I’ve driven—than my LeMans, but it’s all part of some cosmic compact car continuum 25 years later. 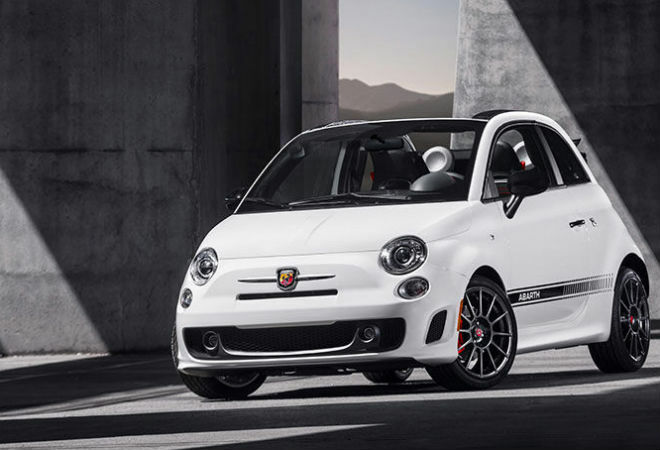 The Abarth, with its sports packaging and cute little cabrio design, is the opposite of the aggressive Ice Cube song. But just like dude mellowed to make family movies, sometimes you need to bump some KDAY on the 101 just like you were a kid again.